Be sure you can live with a turning circle of more than 50 feet when you're considering a truck like the 2008 Chevrolet Silverado 2500HD. Also, consider the fuel bills--and the declining resale value of big trucks as gas prices continue to rise. The 2008 Chevrolet Silverado HD is a focused work truck with excellent capabilities. TheCarConnection.com's editors read the latest reviews on the new 2008 Chevrolet Silverado 2500HD heavy-duty pickups to write this comprehensive review. 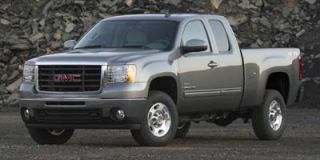 Experts from TheCarConnection.com also drove various versions of the Chevrolet Silverado HD, including the 3/4-ton 2500HD and the 1-ton 3500HD. These experiences enable this team to offer you a definitive opinion on this heavy-duty full-size pickup. This review also compares the 2008 Chevrolet Silverado 2500HD with other vehicles in its class to give you the best advice even when other reviews present conflicting opinions. Chevrolet's heavy-duty truck, introduced as a 2007 model, changes little for the 2008 model year. 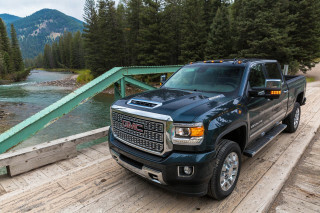 It shares some essential pieces with GMC's Sierra heavy-duty trucks, along with some mechanicals from the big GM SUVs (Tahoe, Suburban, Yukon, and Escalade). You can visually discriminate between a light-duty Silverado 1500 from its more capable brethren, thanks to the HD's raised hood and divergent grille design. While different, compared to the Ford Super Duty, the Chevy looks tame. The 2008 Chevrolet Silverado heavy-duty trucks are offered in 3/4-ton and 1-ton versions, the 2500HD and 3500HD. Three cab styles, three cargo box styles, and five wheelbase lengths are offered, so the Silverado can be ordered to fit specific jobs--such as towing up to 16,700 pounds. This year's changes include standard XM Satellite Radio, available power driver seat on regular-cab Silverado HDs, and revamped gauges. Two new red paints are offered, and Duallie models get 17-inch wheels, up from 16-inchers offered last year. 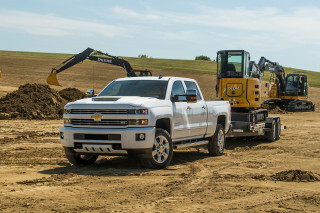 The editors from TheCarConnection.com have experienced the power of the Duramax diesel in the Silverado HD. Matched to the heavy-duty Allison six-speed transmission, the power seems never ending--like Niagara Falls. The gearbox is especially good, with smooth shifts. The two available interiors for the 2008 Chevrolet Silverado 2500HD are similar to those in the light-duty models, and they're comfortable and practical. While the Dodge Ram 1500 has been relegated to a distant third place in the pickup truck sales race for years, in the heavy-duty segment, the 2008 Dodge Ram 2500 and Ram 3500 models compete nearly neck and neck with the Ford Super Duty and Chevrolet Silverado HD pickups. The Dodge's six-cylinder Cummins diesel nearly matches the power of Chevy's Duramax and the Ford's Power Stroke, even though it's running with two fewer cylinders. 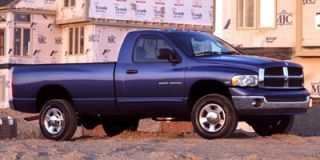 Unlike Ford and Chevy, Dodge's heavy-duty models look just like their light-duty Ram 1500 models. The 2008 Chevrolet Silverado 2500HD is a workhorse that looks less so outside, more so inside. The 2008 Chevrolet Silverado 2500HD is like a bodybuilder in a tuxedo. You can visually discriminate between a light-duty Silverado 1500 from its more capable brethren, thanks to the HD's raised hood and divergent grille design. While different, compared to the Ford Super Duty, the Chevy looks tame. The two available interiors for the 2008 Chevrolet Silverado 2500HD are similar to those in the light-duty models, and they're comfortable and practical. The interior of the new Chevy Silverado HD has "less-plasticky plastics and lower shine," according to Cars.com, which adds that the "mouse-fur liner has been replaced by classier, woven fabric." It's what Edmunds calls one of the Chevrolet Silverado HD 2008's "radically improved interiors." ConsumerGuide notes that when compared to higher-level Chevrolet Silverado HD 2008 trims, "even the basic Work Truck trim has a quality look and feel despite abundant hard plastic." The 2008 Chevrolet Silverado 2500HD is capable of handling titanic loads, yet drives like a smaller truck. The 2008 Chevrolet Silverado 2500HD provides enough brute strength for any towing or hauling task with either its standard V-8 or its optional Duramax diesel. “A 6.0-liter V8 making 353 horsepower and 373 pound-feet of torque and matched to a six-speed automatic transmission is standard on all Silverado 2500HD trucks,” Edmunds reports. 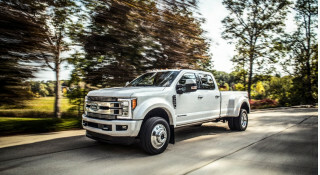 “Optional is the burly Duramax 6.6-liter turbodiesel V8, which boasts 365 hp and 660 lb-ft of torque.” According to ConsumerGuide, the "turbodiesel gets the nod for towing and heavy hauling thanks to its massive 660 lb-ft torque." Popular Mechanics makes note of the "6.6-liter Duramax turbodiesel option, which packs 365 hp and a gravity-altering 660 lb.-ft. of torque paired to an Allison six-speed automatic." 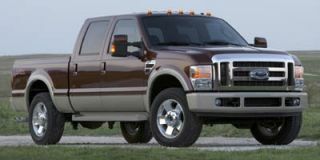 With the diesel, “the 2500HD can haul up to 3,458 pounds and tow up to 13,000 pounds,” Edmunds adds. The editors from TheCarConnection.com have experienced the power of the Duramax diesel in the Silverado HD. Matched to the heavy-duty Allison six-speed transmission, the power seems never ending--like Niagara Falls. The gearbox is especially good, with smooth shifts. Edmunds reports that the diesel’s "standard Allison six-speed automatic is well-suited for towing and hauling large loads." ConsumerGuide states that "a manual transmission is no longer available" for the 2008 Chevrolet Silverado 2500HD. However, "buyers can choose rear-wheel drive or one of two 4-wheel-drive systems with low-range gearing." Such brute strength does not come cheap in terms of energy; Car and Driver warns of "predictably poor fuel economy." ConsumerGuide reports that 2008 Chevy Silverado HD "test results for previous models suggest overall averages of 14-16 mpg for turbodiesel versions, 10-12 mpg for gas models," adding that "GMC recommends regular-grade fuel for the gas V8." Despite its massive size, Car and Driver praises its "great handling...an amazingly smooth ride even without a payload...the Chevrolet Silverado HD tows heavy loads like they're filled with helium." Cars.com says this is most likely because "coil springs have replaced torsion bars in the front suspension, and the recirculating-ball steering has given way to the lighter, simpler and more precise rack-and-pinion design." ConsumerGuide considers the 2008 Chevrolet Silverado 2500HD "tops for comfort among heavy-duty trucks," adding that "brakes furnish stable, relatively short stops with fine pedal feel." 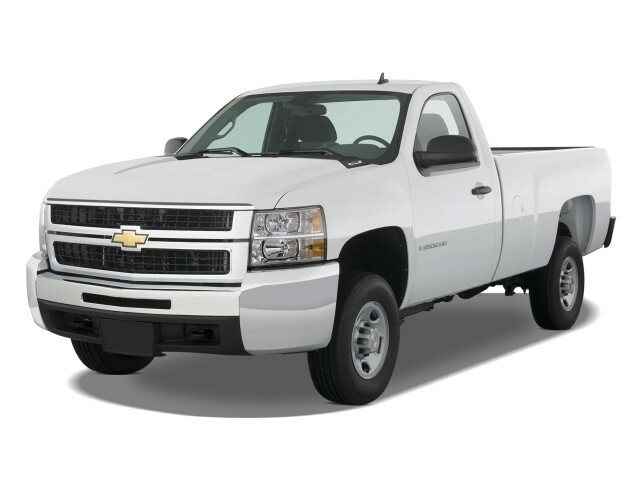 The 2008 Chevrolet Silverado 2500HD is a substantial improvement over its predecessors in terms of comfort and quality. The 2008 Chevrolet Silverado 2500HD allows occupants to ride in remarkable comfort, considering it's a pickup. Cars.com says "in addition to added front-seat legroom, headroom and hip room, Chevy made the interiors seem roomier by moving the dashboards down and forward a few inches." ConsumerGuide notes a "bulky center console, with front bucket seats, limits foot space for rear-center passenger" inside the Chevy Silverado HD. Commenting on one of the higher-level Chevrolet Silverado HD 2008 trims, Kelley Blue Book notes "the 'luxury' interior of the LTZ offers a driving environment straight out of a Tahoe or Suburban." Like other aspects of the Chevy Silverado HD, there have been some improvements in on-board storage; Cars.com reports that "storage capacity has grown thanks to a double glove compartment and even-larger center storage consoles...the optional 40/20/40-split front seat offers a lockable bin in the center seat and another in its backrest/armrest." ConsumerGuide says "ample small-items storage includes large bins and underseat cubbies front and rear, plus big door pockets and, with Pure Pickup interior, a second dashboard glovebox," while "bed-wall rails mount dividers and other add-ons to secure and organize cargo." GM has not changed interior materials of 2008 Chevrolet Silverado 2500HD construction much this year; Cars.com reports, "Interior changes for the Chevrolet Silverado HD 2008 are minor, including brighter pointers in the gauge cluster on all models." There are some improvements, however; Edmunds points out that "where there was once an abundance of lackluster design, hard plastic and uneven panel gaps there's now richly grained upholstery, softer materials and precise fitments." 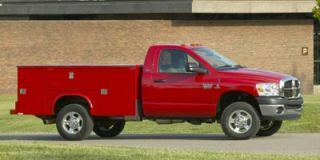 TheCarConnection.com notes that pickup trucks are not known for a quiet ride, but the 2008 Chevrolet Silverado 2500HD appears to be an exception. ConsumerGuide reports that in the Chevrolet Silverado HD 2008 "highway wind noise [is] impressively low for tall, blocky big rigs...tire thrum [is] modest except on coarsest pavement, [and] engines intrude only under full throttle." The 2008 Chevrolet Silverado 2500HD lacks some important safety gear, not to mention crash-test results. Neither the National Highway Traffic Safety Administration (NHTSA) nor the Insurance Institute for Highway Safety (IIHS) has yet seen fit to smash a 2008 Chevrolet Silverado 2500HD, but when they do, TheCarConnection.com will revisit this safety rating. Kelley Blue Book divulges that Chevrolet Silverado HD 2008 "standard safety features include seat-belt pretensioners, tire-pressure monitoring and OnStar." The 2008 Chevrolet Silverado 2500HD offering world-class towing capacity as its main optional feature, though upscale additions such as navigation are available. In base form, it’s a real work truck—but upscale versions of the 2008 Chevrolet Silverado 2500HD gain some fairly luxurious features and options. Cars.com counts out four Chevrolet Silverado HD 2008 versions: "The official trim levels are WT (work truck), LS (Crew Cab only), LT and LTZ." Kelley Blue Book details the following Chevrolet Silverado HD 2008 extras, which are included on specific trim levels: "those living in excessively cold or warm climates will benefit from remote starting on certain trim levels and those wishing to be entertained will enjoy an enhanced DVD system and CD/MP3 audio. Finally, people who worry about getting lost should opt for the available touch-screen navigation system." Edmunds reports the work truck has air conditioning (except in the regular-cab version); OnStar; vinyl seats; and a CD player with XM Satellite Radio. Moving up to the LT gets power accessories and cruise control, cloth seats, and keyless entry, while the LTZ includes leather seating, a CD changer, different interior trim, and power front seats. Looking for a different year of the Chevrolet Silverado 2500HD?